Get Started Today!We provide sensible solutions for signs of all sizes and types, whether indoor or outdoor, lighted or non-lighted. When you need to make an impression, Sign Mine, Inc. is the one-stop solution to draw the attention that you want, need and deserve. 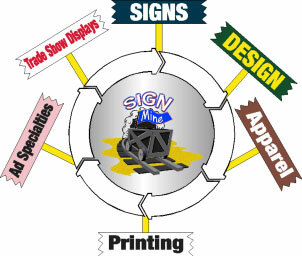 At Sign Mine, IT’S NOT ABOUT THE SIGN…IT’S ABOUT THE AUDIENCE. Sign Mine, Inc.’s team is dedicated to generating and executing impressive, results-driven design concepts for our global business and local business clients alike.